The company’s smart thermostat and smoke alarm will be available to Irish customers at the end of the month, although it may face some stiff competition. THE SMART THERMOSTAT Nest, which was bought by Google earlier this year for €3.2 billion, will be arriving in Ireland later this month as part of its European expansion. Both the Nest thermostat and Protect (a smart smoke and carbon monoxide alarm) will be made available to people in Ireland, Belgium, France and the Netherlands later this month, after being initially available in the US, Canada and the UK. Nest says that in preparing for the launch, it has customised both the products – like recording local actors for the voice of the Nest Protect alarm – and is partnering with energy companies in each country. Nest’s products learns what way you heat your house so it automatically adjusts the temperature in your house, claiming to save up to 20% in heating bills. The company said that the product has been installed in more than 120 countries around the world and has saved an estimated two billion kilowatt hours (kWh) of energy. It didn’t reveal how much either product would cost, saying that it will be announced later this month as well. Nest’s smart thermostat costs £179 (€222) in the UK so it’s likely it will cost a similar amount when it arrives here. Although Nest will have competition in the form of Dundalk-based Climote, which was named National Champion in the 2014/2015 European Business Awards last week. It also allows users to control their home heating straight from their smartphone, and recently landed a major contract with energy giant ScottishPower, one of the so-called ‘Big Six’ energy suppliers in the UK. Email “Anyone for a smart thermostat? Google's Nest to arrive in Ireland later this month”. Feedback on “Anyone for a smart thermostat? 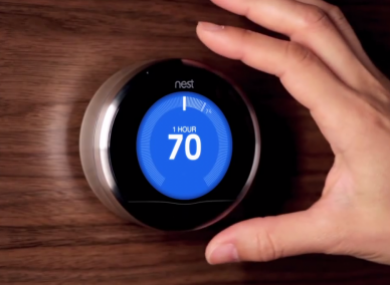 Google's Nest to arrive in Ireland later this month”.